This GitHub repository contains Zato code developed during WSGI Wrestle 2013. It's a middleware cache for exchange rates data fetched using Yahoo! YQL's XML. It's meant to support hypothetical, yet practical, scenarios of storing backend data in a cache close to a frontend application. The client frontend is not included in the repository because Zato is an ESB and backend application server, not a frontend one. The code can form part of a wider process of building analytical applications that need convenient access to aggregated data. Splitting the functionality across multiple applications means higher reusability - Zato provides caching, API and data while frontend systems - no matter what technology they are written with - can focus on their own job of providing interesting and useful user interfaces. All that is contained within a single Python module hot-deployed on servers running in a cluster behind a high-availability load-balancer. ... curl can be used to register a couple of pairs and querying for their current exchange rate. Zato servers run in clusters that are built using gevent/gunicorn with HAProxy in front of them. This is completely transparent from a developer's viewpoint. Services hot-deployed on one server in a cluster are automatically installed on other servers. There are several services involved and each can be independently exposed over multiple access channels though the installation steps show only create-exchange-pair and get-rate. update-cache and trim-cache modify the contents of the cache with a Redis-based distributed lock held. This is needed because each service may be possibly running in multiple copies on more than one server so there must be a way to ensure that each one has access to consistent data only - no partial updates must be visible. dispatch-update-cache is a wrapper service which uses self.invoke_async to asynchronously invoke a separate instance of update-cache which actually updates the cache. Each instance may be running on different server and the load is spread automatically by Zato. The client is built on top of the requests library and can be invoked from Django, Flask or any other Python code. InfoQ have just published a Chinese translation of the original article (in English) that introduces all the major aspects of Zato - architecture, clusters, servers, load-balancer along with a sample financial integration with Yahoo/YQL and Google XML, GUI screenshots, CLI and an overview of all the user-visible features. This is a straight-to-the-point read for team leaders, systems architects and developers. Thanks to 马德奎 for the translation! 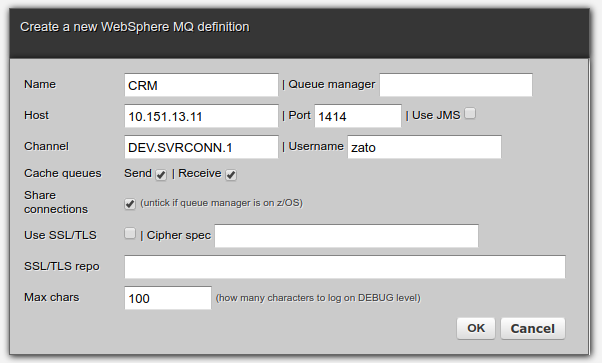 WebSphere MQ is a messaging middleware by IBM - a message queue server - and this post shows how to integrate with MQ from Python and Zato. Everything in Zato revolves around re-usability and hot-reconfiguration - each individual piece of configuration can be changed on the fly, while servers are running, without restarts. Note that the concepts below are presented in the context of WebSphere MQ but they apply to other connection types in Zato too. It is usually most convenient to configure environments during development using web-admin GUI but afterwards this can be automated with enmasse, API or command-line interface. 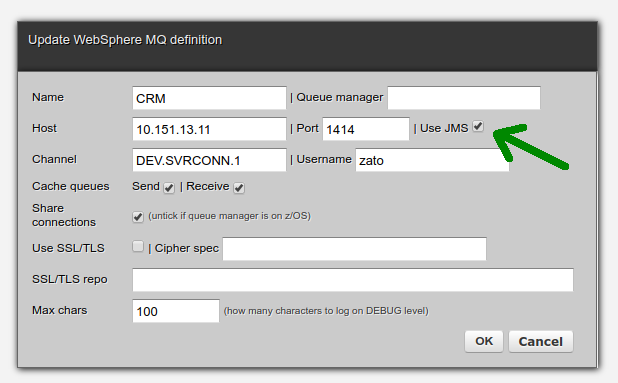 Once configuration is defined, it can be used from Zato services which in turn represent APIs that Zato clients invoke. Then, external applications, such as a Django or Flask, will connect using HTTP to a Zato service which will on their behalf send messages to MQ queues. Having carried out the steps above, you can now send messages to queue managers from web-admin, which is a great way to confirm MQ-level connectivity but the crucial point of using Zato is to offer API services to client applications so let's create two services now, one for sending messages to MQ and one that will receive them.
""" Sends all incoming messages as they are straight to a remote MQ queue. But wait - if this is the service that is a callback one then how does it know which queue to get messages from? That is the key point of Zato architecture - services do not need to know it and unless you really need it, they won't ever access this information. Such configuration details are configured externally (for instance, in web-admin) and a service is just a black box that receives some input, operates on it and produces output. 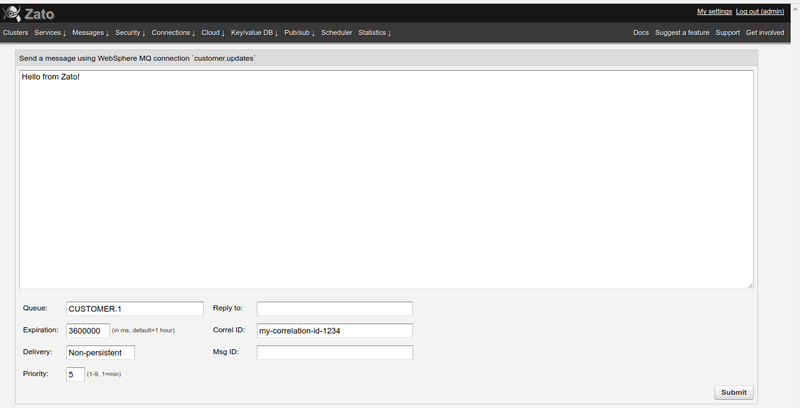 In fact, the very same service could be mounted not only on WebSphere MQ ones but also on REST or AMQP channels. Without further ado, let's create a channel in that case, but since this is an article about MQ, only this connection type will be shown even if the same principle applies to other channel types. After clicking OK a lightweight background task will start to listen for messages pertaining to a given queue and upon receiving any, the service configured for channel will be invoked. You can start as many channels as there are queues to consume messages from, that is, each channel = one input queue and each channel may declare a different service. In many MQ environments the majority of applications will be based on Java JMS and Zato implements the underlying wire-level MQ JMS protocol to let services integrate with such systems without any effort from a Python programmer's perspective. When creating connection definitions, merely check Use JMS and everything will be taken care of under the hood - all the necessary wire headers will be added or removed when it needs to be done. It's worth to emphasize again that at no point are server restarts required to reconfigure connection details. No matter how many definitions, outgoing connections, channels there are, and no matter of what kind they are (MQ or not), changing any of them will only update that very one across the whole cluster of Zato servers without interrupting other API services running concurrently. Let's now check how to add a REST channel for the MQSender service thus letting Django and Flask push MQ messages. Where to next? Start off with the tutorial, then consult the documentation, there is a lot of information for all types of API and integration projects, and have a look at support options in case you need absolutely any sort of assistance! A feature that has been recently added to Zato in git and will be released in version 2.0 is an HTTP request profiler. The profiler is exposed using the repoze.profile library which is a reusable WSGI middleware that can be embedded in other projects too. Over at the #pyugat IRC channel - Python User Group Austria - there was a question how Zato handles XML namespaces given that working with SOAP doesn't require juggling any. So for instance, given this SOAP request a typical Zato service can just freely access the elements without any particular effort. The trick is, Zato uses lxml as its underlying XML parsing library and what can strike one as a smack of pure brilliancy, lxml.objectify's default mode of operation is to assume any child elements are in the same namespace their parent is. It may seem nothing big at first but this is exactly the feature that makes working with SOAP in lxml as elegant (pythonic) as it can possibly get. 90% of time one will be working in the same namespace so why remember about it at all? Yes, namespaces come in handy and yes, there can be multiple namespaces in one document but given that the prevailing majority of SOAP processing is to do with the single one namespace this particular document's business payload is in, why not forget about the whole thing? Not having to deal with it at all was an excellent idea on lxml's part that greatly reduces time spent on development and improves the resulting code's readability, hence lowering the total maintenance costs. 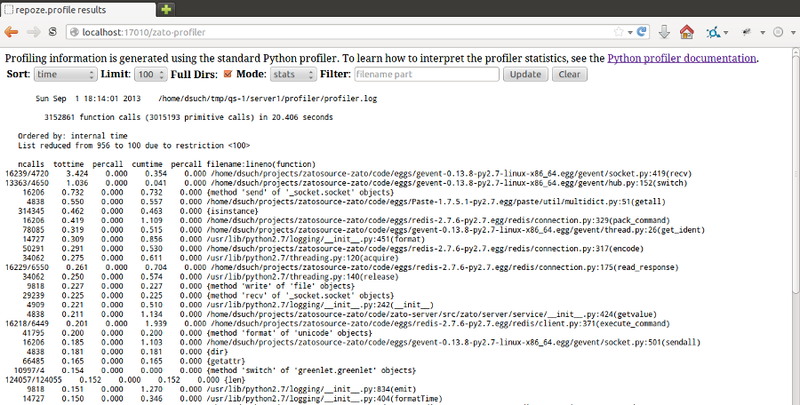 The code above looks like accessing regular Python objects, or perhaps JSON. There is nothing really XML-specific to it. This is what Zato actually does - it finds the first child in soapenv:Body, turns it into a Python object and makes it available to a service in self.request.input. If you're coming to Zato or Python with background in other programming languages, this single feature will make SOAP processing a new experience for you. What if you really need to access multiple namespaces? This, of course, is possible, as in the example below (which is a standalone program, not a Zato service, but the same thing can be done in Zato too). © 2019 Zato Source s.r.o.